Sea Cottage is located in the heart of Glenelg, just a few paces from bustling Jetty Road and the beautiful white sands of Glenelg beach. The Glenelg shopping precinct offers excellent retail shopping including restaurants, hotels, historic attractions, golf and sporting facilities making Glenelg an exciting place to stay. Two Supermarkets are within walking distance of the Cottage, and the bus stops just around the corner taking you to Marion Shopping Centre and Harbour Town Factory Outlet. A 1/2 minute walk takes you to the Historic Glenelg Tram which will deliver you directly into the Adelaide City Centre. The property offers 2 bedrooms (the second with 3 single beds), a lovely lounge room and a full size separate kitchen with large 520 litre family size fridge! Ideal for families, the property provides full laundry facilities and an outdoor entertaining area, including BBQ. Sea Cottage is a short 10 minute drive from the Adelaide International Airport, which makes for a very economical Taxi fare if required. A Taxi rank is just around the corner on Elizabeth St, which along with the Tram ride into the City may eliminate the need for a hire vehicle!! Everything you need for a relaxing, self sufficient holiday in one of the most popular beachside holiday destinations in South Australia, is within easy walking distance of Sea Cottage! **There is no Off-Street Parking, however we have a residential permit park 5 houses down from the cottage available for you to use. We pay the council an annual fee for use of the permit park & will supply the permit for display on your dashboard during your stay. Parking is limited in the street due to a building development under construction across the road from the cottage in St Johns Row. Sea Cottage offers 2 bedrooms, the Master with a Queen Size ensemble and the second bedroom offers three single beds. Sea Cottage is also equipped with a pull out sofa (double bed) and a single roll-away bed, sleeping up to 7 if required. Please advise at time of booking if these facilites are required. Quality Sheridan Bed linen is provided to each bed including an additional blanket per bed. Towels, facewasher and bathmat are also provided. We also provide, for your convenience, an amenity pack which includes soap, conditioning shampoo and shower caps. We also provide a supply of Laundry Powder for your convenience. ALSO AVAILABLE 5 DOORS DOWN IN THE SAME STREET :- SEASIDE MANOR WHICH SLEEPS UP TO 12. Location was excellent just off Jetty Road with a large choice of eating houses and hotels. Property was clean and convenient and suited our needs with the outdoor area quaint. Had a great time and will look to book again next year when carnival dates are confirmed. 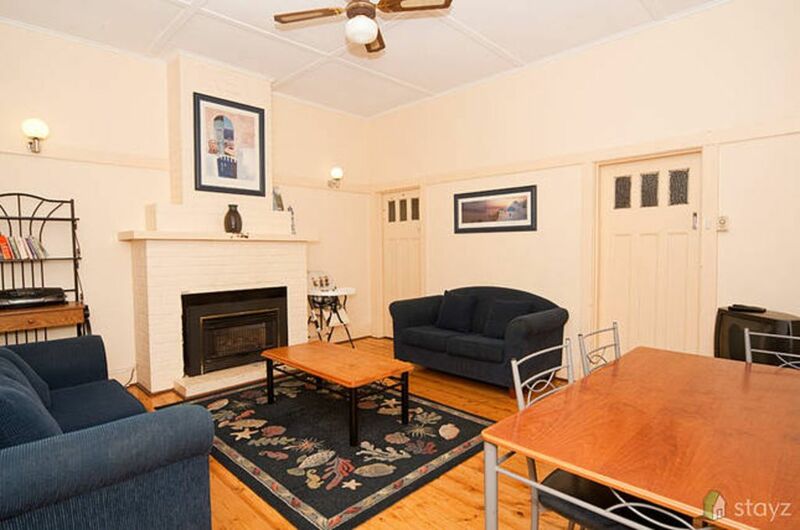 Excellent location right in the heart of Glenelg. Beach and shops only a minutes walk. Quiet area, Loved the shutters as we had young kids so was perfect for keeping the house cool and dark! Everything you need was thought of. Will be back for sure. Great value for money. Thanks Angela. Really enjoyed our stay here and would love to come back. Location was perfect and suited all our needs. Excellent communication from property owner and manager. All questions that we had about Adelaide, property and means of transport were generously answered. This historic property had location and charm that we were looking for. Everything was in working order.